2. Drain and rinse the jackfruit, remove the core, and cut each piece in half. Remove the seeds. 3. Heat 1 tablespoon oil in a large saucepan over medium heat. Add onion and garlic and cook, stirring, until starting to soften, about 2 minutes. Add the jackfruit, rhubarb, ketchup, sugar, vinegar, spices, Worcestershire sauce, and liquid smoke. Stir until the jackfruit and rhubarb are evenly covered. Pour off 1/2 cup of the liquid and reserve it. 4. Add the vegetable broth to the skillet, cover, and simmer for 10-15 minutes until all liquid is absorbed. 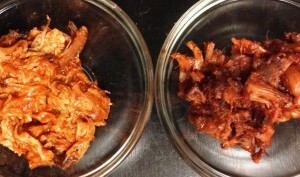 Use a spatula to mash and divide the jackfruit until it looks similar in appearance to pulled pork. Spread the mixture out on a baking sheet and roast it for 20 minutes. 5. Remove the baking sheet from the oven and pour the reserved liquid over the jackfruit and rhubarb, ensuring even coverage. Salt and pepper the mixture to taste. 6. Return the baking sheet to the oven and roast for another 10-15 minutes or until the jackfruit is lightly browned.